The goal of the Development Opportunity Zone (DOZ) Program is to incent new and expanding business in the Cities of Beloit, Janesville and Kenosha. The program supports job creation, job retention, capital investment and environmental remediation by providing nonrefundable tax credits that can help to reduce a company’s Wisconsin state income tax liability, thereby helping to enhance its cash flow to either increase the expansion project’s scope, accelerate the timing of the project or enhance payroll. Also, the program incents the creation of jobs for target group members. Generally, businesses located in or relocating to an area designated as a Development Opportunity Zone under Wis. Stat. §238.395(1) – currently the Cities of Beloit, Janesville and Kenosha – may be eligible for Development Opportunity Zone Tax Credits. Any person that is conducting or intends to conduct economic activity under the DOZ must submit a project plan, in conjunction with the local governing body of the city in which the DOZ is located. (4) The project plan must comply with the requirements under Wis. Stat. Sec. 238.395(3)(b). The following definitions supplement those in Wis. Stat. §238.395, §71.07(2dm) and (2dx), §71.28(1dm) and (1dx), §71.47(1dm) and (1dx), and §76.636. “Certified Business” means a business certified by WEDC as eligible to earn Tax Credits based on the parameters of this guideline and based on the business’ total number of Eligible Employees in the State of Wisconsin as determined by the Federal Employment Identification Number (“FEIN”) under which the business files its taxes. “Certification Date” means the date, designated by WEDC, on which the eligibility to earn Tax Credits begins. No activities occurring prior to the Certification Date will be considered in allocating Tax Credits. “Environmental Remediation” means removal or containment of environment pollution, as defined in Wis. Stat. §299.01(4), and restoration of soil or groundwater that is affected by environmental pollution, as defined in Wis. Stat. §299.01(4), in a brownfield if that removal, containment or restoration fulfills the statutory requirement(5) and investigation unless the investigation determines that remediation is required and that remediation is not undertaken. A “Full-Time Job” means a regular, non-seasonal full-time position in which the annual pay for the position is more than the amount determined by multiplying 2,080 by 150 percent of the federal minimum wage and an individual in the position is offered retirement, health and other benefits that are equivalent to the retirement, health and other benefits offered to an individual who is required to work at least 2,080 hours per year. “Full-Time Job” does not include initial training before an employment position begins. (6) Employees that do not meet the definition will not be counted toward headcount or wages. Part-time employees do not count. “Tax Credits” means the DOZ Tax Credits authorized pursuant to Wis. Statutes §§238.395, 71.07 (2dx), 71.28 (1dx) and 71.47(1dx). (5) Wis. Stat. §71.07(2de)(a)1, 2013 stats. ; §71.28(1de)(a)1, 2013 stats. ; §71.47(1de)(a)1, 2013 stats. (6) While there are two statutory definitions of Full-Time Employee, WEDC utilizes the above identified definition in its contracts. Companies can be certified for DOZ tax credits in four categories: Job Creation, Job Retention, Capital Investment (Real and Personal Property) and Environmental Remediation. Each are described in detail herein. Job creation allocations will be based on projected jobs to be created over three years. Businesses will earn job creation tax credits for a maximum of three years, and must maintain jobs for five years, commencing on the Certification Date established by WEDC. Full-Time Jobs filled by Eligible Employees for which Tax Credits have been verified must be maintained for a period of at least either five years from the Certification Date, or a period of two years after the final earning period for job creation and retention, whichever is longer. Once DOZ expiration date passes, no additional tax credits can be claimed under the program, but the company must maintain all jobs for the full five years after the Certification Date. Award amounts will be made with consideration of unemployment rates, recent layoffs, health benefits, regional poverty rates, distressed county, per capita income, and public involvement necessary to move the project forward. Job retention tax credits are available only for positions that WEDC identifies would not have been retained without the tax credits. Businesses will earn job retention tax credits over five years and must maintain those jobs during the entire five-year period, commencing on the Certification Date. Once the DOZ expiration date passes, no additional tax credits can be claimed under the program, but the company must maintain all jobs for the full five years after the Certification Date. Allocation of capital investment tax credits will be limited to up to 3% of the eligible capital investment. (18) The tax credits can be earned on both real and personal property capital investments. Businesses whose primary activity includes retail, commercial development, recreation, entertainment or direct health care are not eligible to earn tax credits through capital investment. Allocation of credits will be based on eligible capital investments projected over a three-year period. Businesses will have three years in which to earn allocated credits, which will be released annually based on the actual eligible capital investment tacking place during the preceding year. There must be capital investment in a project that is beyond a Certified Business’s normal capital expenditures. This specific purpose includes, but is not limited to, diversifying product lines and modernizing and enhancing the efficiency of production processes. The amount of the investment is at least $10,000 for each full-time employee working at the Certified Business’s project location, or $1,000,000, whichever is less. The depreciable, tangible personal property (i.e., equipment, machinery) must be purchased after the certification date and cannot be purchased from a Related Person. “Related Person” includes a family member, such as a brother, sister, parent, grandparent, child, grandchild, spouse or in-laws; a corporation or any entity that owns more than 50% of the Certified Business; or any corporation which is part of the same controlled group of corporations. To the extent that the property is not being used for the purpose for which the claimant is certified, the credit will be reduced on a proportional basis. Tax benefits for environmental remediation are determined at 50% of eligible costs. (25) A business is not required to quality for job creation, job retention, or capital investment credit in order to obtain credits for environmental remediation under §§ 71.07(2dx)(b)1, 71.28(1dx)(b)1, 71.47(1dx)(b)1, or 76.636, Wis. Stats. (26) Credits may only be earned under this activity for an eligible remediation activity. Each Certified Business will be required to submit documentation outlining the eligible activities, actual wages and expenditures to be awarded its designated DOZ Tax Credits. WEDC may request additional information from the Certified Business. 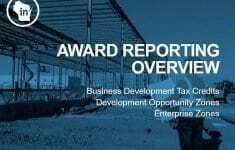 WEDC will annually determine the amount of Tax Credits earned and able to be claimed by the Certified business based on eligible activities and expenditures. (27) WEDC will notify the Certified Business and the Department of Revenue of the amount eligible to be claimed against the Certified Business’s taxes each year with a written verification of the Tax Credits earned. A Certified Business must attach appropriate forms to its Wisconsin tax return submitted to the Department of Revenue to obtain the tax benefits. (28) No person may file with the Department of Revenue for Tax Credits without the written verification of WEDC. Tax Credits are non-refundable. If the amount of the Tax Credits approved for a tax year exceeds the amount of tax due for the tax year, the excess credit may be carried forward for up to 15 years. Assist 2 businesses to support the creation of 10 jobs, retention of 200 jobs, and achieve a 20:1 leverage of other investment. Recipients will be required to annually submit annual project report capital investment, job creation and job retention, as well as any other contract deliverable. The DOZ Program has a continuous application process. Applicants for a Development Opportunity Zone certification should complete an application through a regional economic development director. The completed application will be assigned to an underwriter and go through the award review process. Download more information about the Development Opportunity Zone Tax Credit. If you have questions about the Development Opportunity Zone Tax Credit, please contact your regional development director.